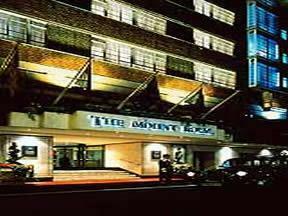 London Hotel close to Marble Arch Underground Station. Located in the heart of London, Thistle Marble Arch is a deluxe base from which to access the capital. Our cordial and attentive staff will happily assist guests with all their needs. Thistle Marble Arch hotel boasts an impressive range of business and leisure facilities to ensure a convenient and enjoyable stay. There is a club floor, gym facilities, business centre, two executive lounges and a theatre desk. The deluxe bedrooms offer an additional sofa seating area and a large en-suite bathroom with walk in power shower. The Marble Arch business lounge is the perfect place to relax between meetings or at the end of a long day. Enjoy a delicious meal in the hotel's themed restaurant before live music in the Glen Miller. Situated on Oxford Street with Hyde Park opposite, the financial district is only ten minutes away via the underground. Paddington with its fast link to Heathrow Airport is ten minutes away via taxi. The hotel is minutes away from fine dining, shopping and entertainment venues. Internet - WiFi is available in all areas and is free of charge. CANCELLATION POLICY: Reservations must be cancelled 1 day in advance of your arrival date. In the event of a no show or a cancellation in breach of this policy, the cost of the entire reservation will be charged. The cancellation policy may vary per room type; please check the room description as well. COMMENTS: Pets welcome by arrangement. By road: from the Marble Arch monument proceed down Oxford Street. Take the first left down Portman Street, then first right down Bryanston Street. The main hotel entrance is situated ten yards on the left. Ncp car parking is available nearby at an additional charge. By train / rail: from Victoria Railway Station, take the bus to Oxford Street and Marble Arch. The Hotel is in Bryanston Street, one road back from Oxford Street. By air: from Heathrow, take the Heathrow Express train, which leaves every fifteen minutes, to Paddington Station. A taxi ride from Paddington to the hotel will take ten minutes. Alternatively, catch the Heathrow Airport Bus Service that stops on Oxford Street, opposite the hotel.